On Wednesday 31 May a terror attack shook the capital Kabul leaving at least 150 people dead and more than 400 wounded. Many buildings have been badly damaged including some embassies present in the area. 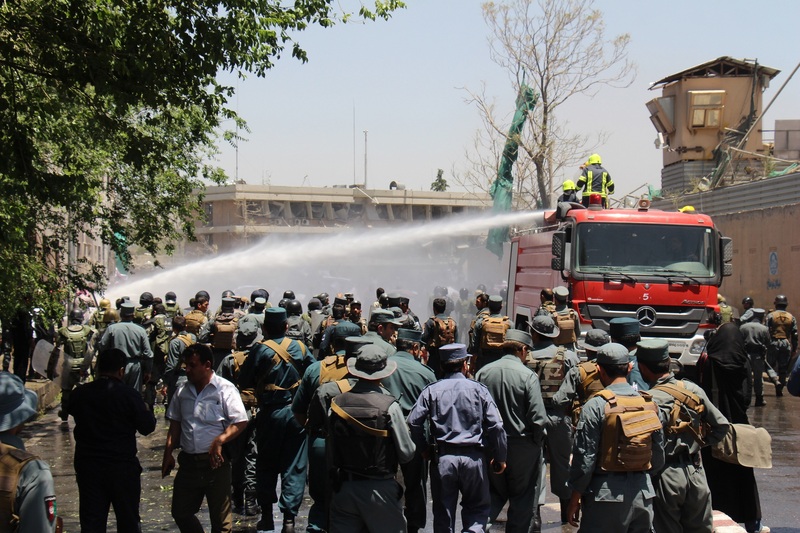 While the German Embassy staff employees saved themselves only because they received an earlier warning of the threat, most of the people in Kabul have not been so lucky. According to many reports, the huge bombing has been carried out by a tanker contracted by embassies and belonging to the private company of Mirwais Yasini, a renowned MP from Nangarhar. Intelligence sources claim that the attack was organized and conducted by the Haqqani Network with the support of the Pakistan military Intelligence ISI but many people in Afghanistan believe that the attack would not be possible without an inside hand. Incredibly to this day Mr. Yasini has not been interrogated on why the terrorist had one of his tankers. In response to the attack President Ashraf Ghani ordered the execution of eleven Haqqani network prisoners. Taliban threatened that if the terrorists will be executed, foreign hostages will be killed in retaliation. 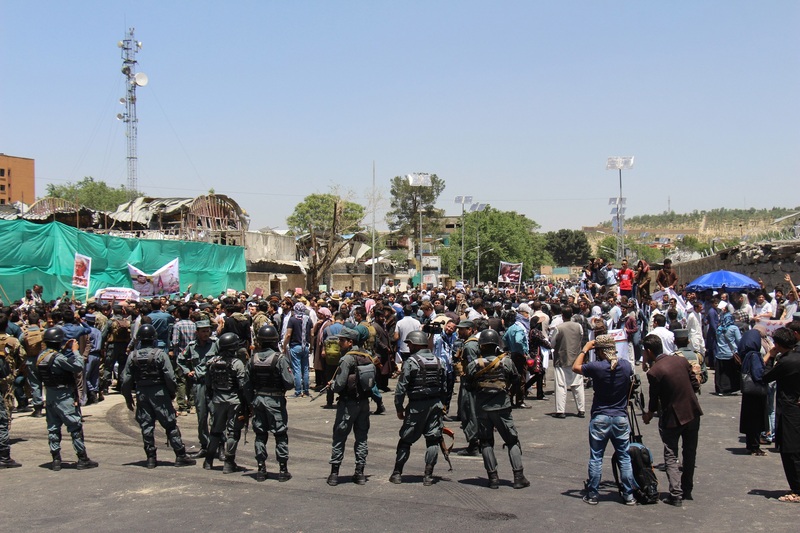 After some hours from the attack, a protest erupted when hundreds of people gathered together in Kabul to demonstrate against a government considered unable to ensure security to its own citizens. While most of the people demonstrated peacefully some of them reacted angrily and started to throw stones at the police. Immediately after the tragedy the country found itself united in mourning. Brave journalists risked their lives to report about the situation, citizens rushed out to hospitals around the city to donate blood and some of them collected money for the victims. But when the protest against the government erupted, many people started to take position; some of the supporters of the government reduced the entire demonstration to few violent people, while others defended the democratic right of citizens to demonstrate. Soon the attention shifted from the terror attack to the protest legitimacy. On Saturday afternoon during Senator Ezadyar’s son’s funeral, a series of attacks hit the capital. Three kamikaze blew themselves up, killing at least 18 people. At the burial service were present also the Chief Executive of Afghanistan Abdullah Abdullah, the State Minister for Security Reforms, Amrullah Saleh and other former member of Ahmad Shah Massoud’s Northern Alliance. Afghanistan is still struggling to become a nation: in all its history there has been only one President that didn’t belong to the main dominant ethnic group, different groups have their own traditions and moral codes, and a common history with a single legacy doesn’t exist. But if it’s true that Afghanistan is not a nation-state, in front of these multiple attacks on civilians, it would be better acting like if it was. Because as the French philosopher and historian Ernest Renan said: “A nation is a large-scale solidarity”, and in this kind of society there is no place for Taliban or for ethnic supremacy. But nothing of this will be achieved without an inclusive government, a balanced development for the country and an equal treatment of all the people who contribute to the richness and beauty of Afghanistan.